The cool morning gradually warmed into a blazing hot day as the sun made its long, slow arc across the cloudless and seemingly eternal blue sky. The couple drove deeper, in a brutally uncomfortable silence, into the Montana plains, now brown and motionless under the relentless late summer sun. Just a few minutes earlier Reilly and Addison had felt connected and attuned. The second day of their long road trip had started off well. As they made their way through the mountain passes lined with giant pines and crisscrossed by cold and clean mountain streams, they imagined together what it must be like in the winter, covered in snow. Reilly was driving with a hand gently laid upon the inside Addison’s left thigh. Reilly’s arm was just long enough to comfortably reach Addison and to find rest there. They laughed and joked and made plans together for their next rest stop and meal. The conversation casually and naturally turned, like the curves in the mountain road. “I’ve been all over the world,” Addison said placing a hand on Reilly’s, “and I’ve never seen any place as beautiful as this place.” Reilly’s heart skipped a beat, not in a good way. The descent into silence was as unexpected and sudden as was the appearance of the endless dull brown plain that lay before them. Suddenly it felt like the connection was broken. Reilly’s arm didn’t seem quite long enough to reach Addison comfortably and was slowly and with effort to be inconspicuous, drawn up to the two o’clock position on the steering wheel. Reilly was taken away by unpleasant thoughts about Addison’s trips with previous partners. Reilly could never afford those kinds of trips; this was their vacation for the year. Reilly was consumed by thoughts of inadequacy and wondered why Addison had stuck around this long. Reilly was miles and miles and years and years away from Addison. Lost in thought, taken away by anxiety. Silent. Addison felt Reilly’s distance and in the thick silence a quiet interior panic set in. 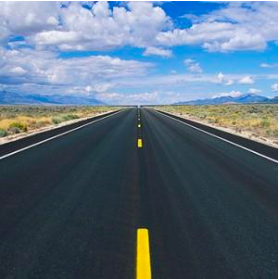 Addison looked at Reilly who stared unflinchingly through the dirty windshield at the endless black strip of two lane highway that sliced through the plain. It felt like they were moving in opposite directions. “Are you alright? Is everything OK?” Addison asked, not really expecting an answer. Reilly responded true to form, “I’m good. Just tired.” Addison turned and gazed out the passenger side window at the small farm houses and pastures dotted with thin herds of cattle. They had traveled this road before, many times. At the end of the road, Addison knew, there would likely be a big fight. This kind of silence always seems to lay the foundation for a fight. They would say things that they would later regret and would both feel hurt for days. It was their cycle. How many couples have found themselves sitting in a heavy silence, miles and years away from the person at their side with whom they most want to connect. It’s exceedingly difficult to connect with others when we are caught up in anxiety, shame, and defense. Many couples experience a repetitive pattern of being triggered, falling out of attunement, missing each other, struggling in their own way to regain that connection they so long for, and sometimes giving up and looking at the cows on the side of a country road. This giving up occurs because they haven’t learned how to get back to their attunement; or because getting back seems too hard. 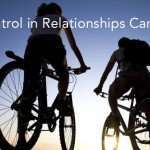 Attachment based couples therapies like Emotionally Focused Therapy and Accelerated Experiential Dynamic Psychotherapy for Couples are attentive to the biologically engrained human drive toward connection. Couples therapist working through these approaches are relentless in our efforts to help the couple rebuild or build a secure, long lasting connection that allows each member of the couple to be their open-hearted true selves. Coming down from a place of shame and anxiety and defense is challenging for all of us. In our culture, we often try to think our way out of this dark and difficult place. AEDP Certified Therapist and Supervisor Hilary Jacob Hendel has made finding our way out of defense and anxiety and back to our true open-hearted selves much easier. In her book It’s Not Always Depression, Jacobs Hendel introduces a user friendly version of The Triangles of Conflict and Experience to a broader audience. 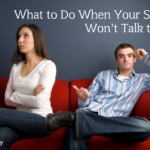 This has been used for years by psychoanalytic and psychodynamic psychotherapists. Since reading her book, I have been drawing out the triangle for my individual patients and couples in treatment. I even use it for myself individually, and my spouse and I use it together as a couple. I’d like to use the first of this three part series to very briefly introduce the Change Triangle and share some thoughts for how the individuals in our road trip couple might use the Change Triangle to bring themselves back. In the second part of this blog, I’d like to explore some ways that they, as a couple, might use the Change Triangle to understand and attune to one another more deeply and to promote intimacy and deeper connection between them. 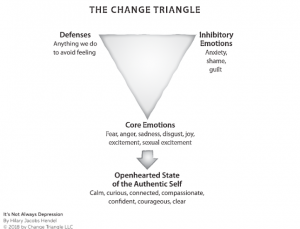 The Change Triangle is an inverted equilateral triangle which visually represents our emotional experiences and reactions. In the top right, we find the inhibitory emotions of anxiety, shame, and guilt. These are emotions that are somehow safer to feel or in some way preferred over the core emotions of fear, anger, sadness, disgust, joy, excitement, and sexual excitement that we find at the bottom tip of the triangle. Why these inhibitory emotions might be preferred over core emotions depends on many factors. Perhaps we grew up in a family where we were told “boys don’t cry.” If we begin to feel the core emotion of sadness, the inhibitory emotions of anxiety and shame might take over to keep us from feeling sadness. In our culture, men are socially permitted a very limited range of emotional expression. My experience has been that men often experience anger or defensive anger as an inhibitory emotion. The process of distinguishing this type of anger from anger that is being felt as a core emotion takes some practice for men and for their therapists. If we grew up in a family where women were shamed for sexuality, when we feel sexually excited, shame and anxiety may creep in. The inhibitory emotions are our secondary emotional reaction to our core emotions. In the upper left corner of the triangle are our defenses, the actions we take in order to avoid feeling our core emotions. If boys don’t cry, we will push away from anything that makes us sad. If we were taught that women shouldn’t experience sexual desire, we may avoid those to whom we feel attracted and become emotionally distant or we may go to great lengths to ensure that no one finds us attractive so that we are never in a position to have to respond to that. 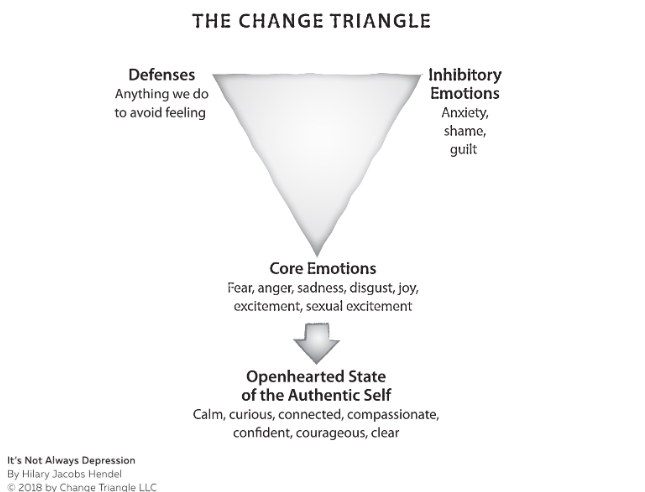 Below the Change Triangle, accessed by going through core emotions, is the open-hearted or core state, a state of openness, authenticity, and connection. The experience of our core emotions in the key to the experience of our authentic selves. In short, if we don’t feel free to feel our core emotions, whatever the reason, we will shut down, deny, isolate, and numb with distractions or addictions—we will never express or be our open-hearted true selves. But when we are brave enough to face those difficult core emotions, to experience them and to express them we begin to live a different life, a more authentic life, a fuller life, a wholehearted life. If we begin to express ourselves, to live from this open-hearted place we begin to experience life differently. We begin experience ourselves differently. Our partners have a different experience of us and we have a different experience of them. It is in this place that that which is in us that has been wounded and needs healing can be touched and healed by love. It is from this place that we can love our partners with our whole hearts and we can touch and heal that in them which is most in need of love. It is from this place that our stuckness is dissolved, that old patterns are broken, and unskillful behaviors are changed. When couples speak to one another from this place—they hear one another, sometimes for the first time. In the next article in this series, we will work the Change Triangle together with Reilly and Addison and learn how they can save their road trip and live a more wholehearted life together. Breaking Up is Hard to Do — With Friends, Too.